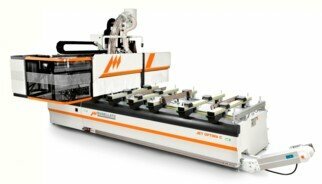 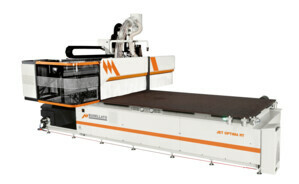 Compact, high performance CNC working centre for the production of office and home furniture. 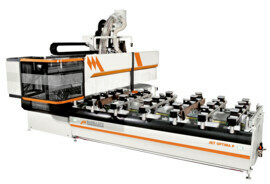 The work table is equipped with a reticular grid allowing nesting machinings and can be equipped with an automatic panel loading/offloading device. 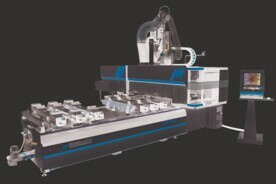 3 or 4 axes compact working center (5th positioning axis). 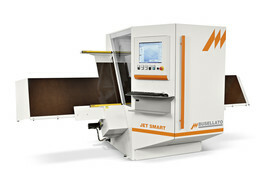 Versatile, low-price and easy to configure CNC working center for the production of furniture components, hollow core interior doors, interior doors with solid wood elements and stair components. 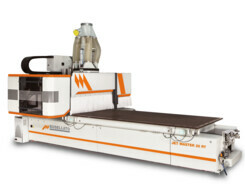 3 or 4 axis CNC working center (5th positioning axis) for the production of furniture components, hollow core interior doors, bar and shop fittings, interior doors with solid wood elements and stair components; very thick parts can also be machined. 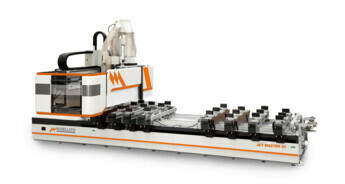 3 or 4 axis CNC working center (5th positioning axis) for the production of furniture components, hollow core interior doors and windows using clamping systems. 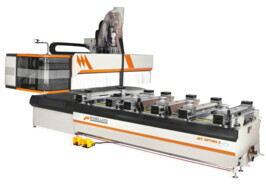 The machine can be equipped with automatic positioning and clamp quick release system.